The e-learning videos of chapter 2 “Academic Principles” introduce you to five major academic principles. These sets of unwritten rules prescribe a certain formal and material behaviour in academic research and writing. Although there is often no legally binding rule set in academic research and writing, certain conventions have been developed and generally accepted by academia. The five major principles presented here are a way to collect dispersed rules and standards and organise them in a systematic way. The five principles are defined as accuracy, completeness, clarity, comparability and materiality. The principle of accuracy implies the observation of applicable rules and norms, the inter-subjective comprehensibility of the research output, the timeliness and currentness of processed information as well as the true and fair representation of the research project. The principle of completeness demands qualitative completeness and quantitative completeness. The principle of clarity requires the clearness and the proper composition of academic texts. The principle of comparability implies obeying the status quo of the discipline and explaining deviations. 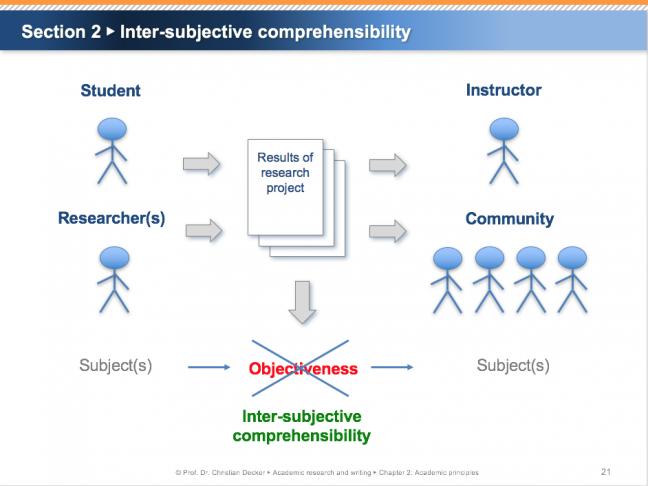 The principle of materiality prescribes an adequate reduction of inherent complexity and demands adequate decision usefulness for the recipients of a research project. New cooperation with ZEPRA: Certificates of completion available now!